Robbins top is original style with the heated/defroster glass window with a PERMALOK lifetime window bond. Robbins top is made with the sound dampening sound pad and rainguards. If you have a 2007-2009 Tan top please order the other item. We offer it in the Sunfast or Stayfast canvas. Robbins & Xtreme tops are ready to install out of the box! Both manufacturers are known for quality workmanship and precision patterns. Both brands use only first quality materials. Combine that with the finest custom workmanship and you end up with a long lasting top that fits correctly and looks sharp. Xtreme tops are high quality convertible tops, original materials, 6 year warranty and offered at reasonable priced. Sometimes there are fewer color selections for the Xtreme Auto Tops. for your new Toyota convertible top. 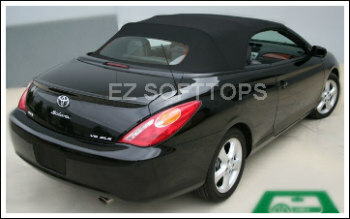 This top fits the 2004 Toyota Solara convertible, 2005 Toyota Solara convertible, 2006 Toyota Solara convertible, 2007 Toyota Solara convertible, 2008 Toyota Solara convertible and 2009 Toyota Solara convertible. Sunfast canvas is a three-ply composite. It is a tightly woven cloth canvas. The yarn is solution dyed before it is woven so the color is uniform throughout. 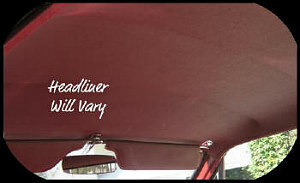 Most convertibles that came with a cloth top were originally Stayfast canvas. Stayfast is more expensive than the vinyl options. 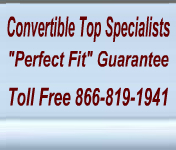 This convertible top is a superior product with excellent wrinkle and U.V. resistance. Weatherability is superior and excellent durability and low temperature flexibility. The headliner is a soft fabric piece that covers the bows and frame from view.